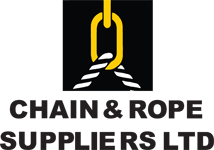 Chain and Rope Suppliers carry a complete range of stainless steel wire rope. Our stainless steel wire rope is available in 3 main strand constructions 1x19 (1 bundle of 19 strands of wire), 7x7 (7 bundles of 7 strands of stainless steel wire) and 7x19 (7 bundles of 19 strand of stainless wire. Where the various constructions of the stainless steel wire rope give the wire rope different qualities such as variance in flexibility and strength. As standard we carry 1.5mm stainless steel wire rope, 2mm stainless steel wire rope, 2.5mm stanless steel wire rope, 3mm stainless steel wire rope, 4mm stainless steel wire rope, 5mm stainless steel wire rope, 6mm stainless steel wire rope, 8mm stainless steel wire rope, 10mm stainless steel wire rope and 12mm stainless steel wire rope. Stainless steel is a finish which provides excellent corrosion resistance in harsh environments such as salt water, waste water treatment etc. Stainless steel is also used in the food processing and pharmaceutical sectors as it is a more hygienic option than alternative finishes such as galvanised wire rope and pvc covered wire rope. Stainless steel is often used in construction as its bright lustre and finish makes it aesthetically pleasing and so stainless steel wire rope is often used in the construction of balustrades, balconies, railings etc. by architects. Stainless steel wire rope is also known as stay wire or catenary wire. 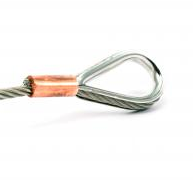 It is often used as a stay wire for flues and other objects like masts. It is known as catenary wire when it is used for hanging lighting etc. Chain and Rope Suppliers carry 3 grades of stainless steel wire rope as standard 316 grade stainless steel, 304 grade stainless steel and commercial grade stainless steel. We also stock all of the components used with stainless steel wire rope including stainless steel bulldog grips, stainless steel wire rope grips, stainless steel eyebolts, stainless steel eye nuts, stainless steel shackles, stainless steel tensioners, stainless steel turnbuckles, stainless steel swivels, stainless steel pulleys, stainless steel carbine clips, stainless steel “s” hooks, stainless steel swivel sling hooks, stainless steel pulleys and copper ferrules the list is endless! For more information on Chain and Rope Suppliers stainless steel wire rope contact us using our contact form or call us on 00353 1 457 0021. We will be happy to talk with you.